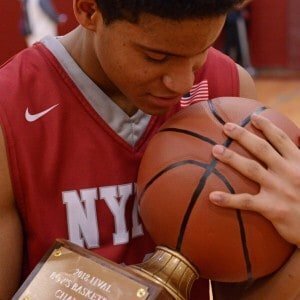 On Saturday, 2/24, NYMA (21-3) hosted Marvelwood in the HVAL Championship game. NYMA won by the score of 62-43 and was led by Zaahir Woody who scored 30 points. The Knights also had solid performances from Karif Isaacs who finished with 14 points and Branden Evans who had 13 points. NYMA won the division by going 10-0. This is their first League Championship since 2014. For more photos from the big game, please visit: Facebook Album: Basketball HVAL Championship. 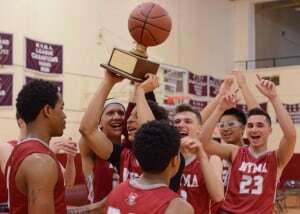 NYMA was awarded the #1 seed in the prestigious NEPSAC tournament. They will have a first round bye and advance to the semifinals where they will play Saturday against the winner of the Boston Trinity/Marvelwood game. Game time and location for this match-up will not be determined until Wednesday night or Thursday morning.